Kevin Edgington returns for his second season as the Box Office Manager/Account Executive. 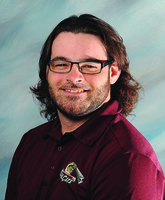 This is Kevin's third year with the RailCats after spending 2016 on the operations and grounds crew staff. Having been involved with sports his whole life, Kevin graduated from Ball State University with a B.S. in Sports Administration with a minor in Management. After graduating in December 2016, Kevin has come home to Crown Point. Kevin is an avid baseball and hockey fan. His favorite teams are the St. Louis Cardinals and Chicago Blackhawks.